The biggest difference from moving from a townhouse into a single family house is the backyard. I get the opportunity to buy outdoor furniture. The non-grass section of my backyard is approximately 15 ft by 15 ft. I do already have a Weber E-210 grill, which the furniture should complement. I'd most likely be simultaneously grilling and entertaining. I ended up with a Zero Gravity Chair from what I believe is a no-name brand off of Ebay. My first though when I unpacked the box was that it was much larger than I expected. Thinking back, it makes perfect sense, since the chair would have to support the length of my body. The size may make it more of a challenge for camping trips. The chair itself is comfortable for a fold up chair. I've been told its not the most flattering looking lawn chair. The chair can only reclining in one way, so don't expect the back to reclining without your legs pulling up at the same time (like you might find of traditional pool chairs). The frame is all metal, the mesh portions support my weight, and the arm rests are plastic. Usage wise, it's a bit challenging the first time to recline the chair, as there is not a lever to pull. There are also two locking mechanisms, but they are essentially useless. At best, the locks might slow down un-reclining. When folded up, I don't find an easy way to lock the chair to the chair from partially opening up. That being said, it does fold up reasonably well for such a large chair. The headrest is more useful than I originally expected, and have heard of it being used for lumbar support. After shopping around at many local B&M stores such as Lowes, Scandinavian Designs, and Bed Bath and Beyond, I discovered outdoor furniture are available with wide price range. Permanent outdoor furniture with padding will cost me anywhere between $1000-$15000 plus the cost of furniture covers to protect it from the weather. However, simple fold up or plastic chairs are much more affordable and can be purchased for less than $200. What I decided was I wanted furniture that could be put away during the rainy season. Therefore (and luckily), the expensive permanent outdoor furniture solution was out. That led me down the path to eventually finding decent reviews of the Zero Gravity Lawn chairs. After watching the prices for a few weeks, I found interesting enough that the Zero Gravity Lawn chairs, though similar can have a wide price range. Depending on the manufacturer and brand, the price can vary. And from the pictures and description, it was difficult to differentiate any differences in the product. I therefore decided to go with the cheapest Zero Gravity Chair I could find. By searching SlickDeals, I found there was an expired deal for two Zero Gravity Chairs for 69.99 with free shipping! But it was expired! 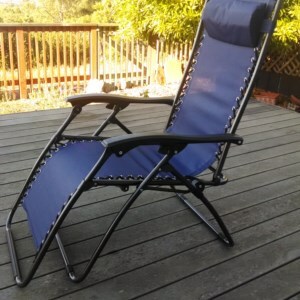 So I set up alerts on both SlickDeals and Ebay for Zero Gravity chairs and waited patiently for a similar deal. After a couple weeks, the deal was back and I purchased my Zero Gravity Chair.